December 30, 2011 in "india"
It is a strange fact that the best people to visit in Delhi are dead. Since Hindu death rituals involve cremation, rather than burial, only the tombs of India's Islamic rulers survive as monuments to its history. Oddly, there are very few examples of palaces for these ancient rulers with even the Taj Mahal --India's most famous landmark-- being a mausoleum built for the third wife of the Mughal emperor, Shah Jahan. One is forced to conclude that each ruler dedicated his time to building the most magnificent resting place possible, while camped at the construction site in a degradable mud hut. The fee to entre the main tourist sites around India is two tiered, with the fee for foreigners typically over a factor of ten higher than that for Indians. Still, even with this discrepancy, the cost was not unreasonable being typically 250 rupees or about $5. (The Taj Mahal was the high exception at 750 rupees for foreigners but then... it was the Taj Mahal). I didn't feel this difference was unfair, since maintenance of these buildings must be fairly phenomenal yet a single price would mean most locals couldn't enjoy their own city. My friend pointed out the only possible problem would be for visitors from countries such as Sri Lanka, whose economy was weaker than India's own. Possibly, the solution would be for them to claim to be local. With 1,652 mother tongues recorded in the Indian 1961 census, it would be hard to prove otherwise. 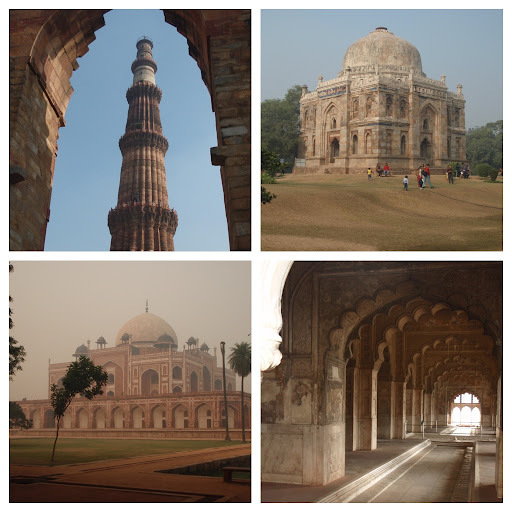 We started our exploration of India's great dead at the Qutub Minar: a tower 72.5 meters high made of red sandstone with decorative elements reflecting both Islamic and Hindu styles. Its construction was begun by the first Sultan of Delhi, Qutb-ud-din Aibak in 1192 and completed by his slave-turned-son-in-law and third Sultan, Iltutmish (and you thought America was the land of opportunity). The latter's tomb is in the same complex along with a few other Sultan's. From there, we moved onto Lodi Gardens where multiple tombs from the 15th century lie in extensive gardens where families were picnicking and other... uh, soon-to-be-families... were doing slightly more than picnicking. Like in Chile, children in India typically live with their families until marriage, making the possibility of 'getting a room' rather slim. Also like Chile, there are stray, but friendly, dogs everywhere. Woof. Next we visited Emperor Humayun's tomb, commissioned in 1562 by the Emperor's wife. Not only does this vast building contain the impressive resting place of the above mentioned deceased, but its plinth houses a further fifty-six cells in which rest over 100 other gravestones. Slightly strangely, these hangers-on are not all neatly stashed away inside the rooms but a select few seem randomly dropped outside the door as if left there by mistake. I suggested this was laziness on behalf of the people charged to do the burying while my friend opted for a building error like in 'Sim City' where you mistakenly place objects with an accidental click of a mouse button. Some tombs, like the one above, were built by the grieving loved ones of the deceased as either a loving memorial or out of desire to maintain their own status. More tombs, however, were built by their owner during his lifetime. This seems a somewhat morbid occupation for a king, and doubly odd since no sign of where he might have lived in life survives. The one exception to this is the Red Fort in Delhi. Outside, it appears to be a stronghold in red sandstone but, rather like a cream filled chocolate, once through its forbidding walls you reach an area of extravagant pleasure in white marble. Built in the 17th century, it was the residence of the royal family, with open walled buildings through which waterways ran. Clearly, one was suppose to laze by the pool side and.... think about the tomb you wanted to construct.